Welcome to the 1962 to 1965 Mopar®Web Site! 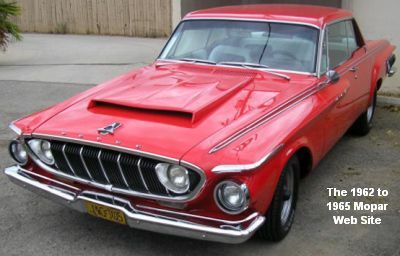 What is New at The 1962 to 1965 Mopar Web Site! View all Mopar of the Month cars! The 1962-1965 Mopar Mail List Clubhouse: Join a mail list discussion group dedicated to these Mopars! Did we help your Mopar restoration? Support the 1962 to 1965 Web site with a donation. Search the 1962 to 1965 Mopar Web site! Read Steve's archived drag racing stories! Crossram Memories -- A Guest Column for 1962 to 1965 Mopar Fans! that's me! I do the web mechanic maintenance as well. Updates of this site will regularly occur as possible. Note: Some mail just gets lost in the Internet’s Web! If you sent an e-mail and never heard back, send another e-mail. Have a great time browsing this web site! that I just forget what I was looking for. Thanks! — Hans H.
the Plymouth would not be on the road today. — Dennis C.
Unless otherwise noted, material is copyright © 1997, 1998, 1999, 2000, 2001, 2002, 2003, 2004, 2005, 2006, 2007, 2008, 2009, 2010, 2011, 2012, 2013, 2014, 2015, 2016, 2017, 2018, 2019 by Gary Hamel. Please read the General Disclaimer. By accessing this Web site, and any associated, internally-linked Web subdomain sites you agree and accept the conditions set forth in that document. Disclaimer #1 Chrysler Corporation in no way endorsed this Web site. Mopar® was a registered trademark of the Chrysler Corporation, as were the marques of that corporation, including Chrysler®,Dodge®, Plymouth®. Jeep®, and Eagle®. FCA US LLC. and marques that currently apply, such as Mopar®, Chrysler®, Dodge® Ram®, Jeep® are registered trademarks. Certainly Chrysler in no way endorsed the 1962 to 1965 Mopar® Web Site; nor now does FCA US LLC.! Mopar® remains a registered trademark. Please note the information supplied here is provided as a service to the Mopar hobby. The material presented is believed accurate, but it is not warranted, guaranteed or presented as absolutely correct. Use the advice and information on this Web site at your own risk.